Disconnect all electrical power BEFORE installing or servicing the buffet table element or resetting the manual reset button for the thermal cutout safety device. Failure to do so could result in personal injury or property damage. The heater must be installed by a qualified person in accordance with the National Electrical Code, NFPA 70. Do not operate at voltages that exceed the stamped/engraved voltage on the actual heater. Using higher voltages will dramatically shorten the heater life. Mount heater in the tank so the tubular heated section above the mounting plate is TOTALLY IMMERSED in the tank by the liquid specified by the equipment manufacturer. The heated section of the heater must ALWAYS be totally immersed in the tank liquid BEFORE the heater is energized. The thermal cutout on your urn heater provides burn-out protection when the heater is accidentally run dry, and the thermal cutout will need to be replaced after it cuts the heat power off a few times. If users repeatedly run the tank with no water, the thermal cutout will only shut the heater off two to four times, and then it may no longer function properly and the heater will burn out. Replacement thermal cutouts are available to help prevent premature heater burnout. The thermal cutout is a safety device ONLY and should NOT be used as a control for monitoring low liquid and no liquid levels in the tank. 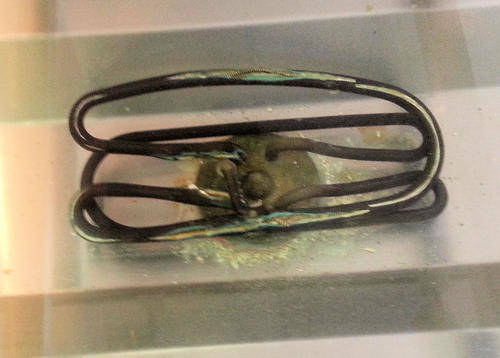 PARTIAL IMMERSION of the heating elements while energized can dramatically shorten the heater element life. It is the responsibility of the purchaser and/or equipment manufacturer to select the heater sheath material based upon their experience with the liquid solution’s chemical composition and corrosiveness, the materials entering or making contact with the liquid solution, and the equipment controls maintained on the liquid solution process. Urn immersion heaters are typically used as a source of heat for steam tables, coffee urns, kettles, sterilizers, percolators, humidifiers and other water heating application. Urn heater tubular elements should be checked regularly for visible signs of calcium or scale build-up or signs of corrosion and should be cleaned, if necessary, using a wire brush or stainless steel wool. Build-up or corrosion can act as insulation and will shorten the heater life. The liquid tank should be checked regularly for sediment around the heater. Sediment build-up left in the tank can act as an insulator and will reduce the electrical heater life. Check for loose terminal connections and clean terminal ends to remove any contamination. If corrosion is noted in the terminal enclosure, please check the terminal box gasket and replace, if necessary. The conduit should also be examined to fix any conditions that are allowing corrosion to enter into the terminal housing.